Developed with input from tactical professionals, the Schmidt & Bender 3-12x50 PMII/P Riflescope is designed to provide users with a versatile optic for use from close to long ranges without compromising performance. To accomplish this, they started with a broad zoom range that is practical for all distances, without causing excessive image dimming common with higher-magnification scopes. Its large objective gives the scope enhanced low-light performance and keeps images bright and clear when the power is dialed up. Image brightness is further increased through the use of index-matched anti-reflection lens coatings that are custom-engineered to the glass used on the lens elements for maximum light transmission. This version of the PM II/P features 0.1 mrad windage and elevation impact point correction to get users precisely on-target. The turrets rotate in a counter-clockwise direction, with the elevation turret traveling through the 12 mrad range, and the windage turret through the ±6 mrad range, in a single rotation. 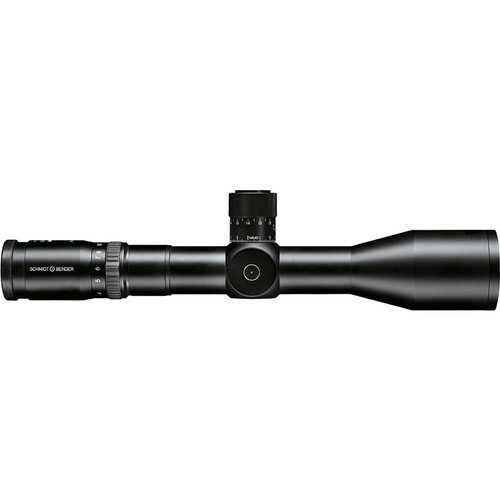 The scope's housing has a larger 34mm one-piece main-tube and is made of a lightweight aluminum alloy that has a scratch and corrosion-resistant matte-black anodized finish. The housing is nitrogen-filled to provide the Zenith with fogproof performance in all weather, and is O-ring sealed to be waterproof to 9.8 feet.